21 November 2018 – Yesterday, 20 November 2018, United States (US) President Donald Trump issued a statement on the murder of Saudi journalist Jamal Khashoggi, addressing the question of the Saudi Crown Prince’s involvement. The statement, lauding the Gulf Kingdom’s crucial role in protecting US national security interests, starkly overlooked the likely role Crown Prince Mohammed bin Salman (MbS) played in the journalist’s premeditated death. 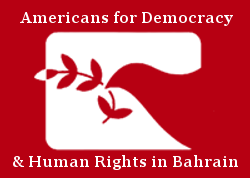 Americans for Democracy & Human Rights in Bahrain (ADHRB) unequivocally condemns such a weak stance on blatant human rights abuses from the White House and the overwhelming disregard of any indicators of Mohammed bin Salman’s hand in the matter. Khashoggi, a Washington Post contributing writer, first disappeared on 2 October 2018, last seen entering the Saudi consulate in Istanbul, Turkey. In the days that followed, an investigation into his disappearance dominated international news as a diplomatic crisis mounted. The Kingdom of Saudi Arabia denied any knowledge of the disappearance, until it was finally announced that Khashoggi had been murdered upon entering the consulate. Since the announcement, surmounting evidence has increasingly shown that the Crown Prince likely held some degree of knowledge of Khashoggi’s murder, including the presence of one of his own aides in the consulate moments before Khashoggi’s arrival. The involvement and sanctioning of one of MbS’s advisors, Saud al-Qahtani, and news of a CIA assessment from the New York Times further complicated matters. The assessment from the US’s intelligence body reportedly proved damning to the Saudi prince, citing officials in the Agency holding “high confidence” in the involvement of the Mohammed bin Salman. However, the response from President Trump in his statement was nowhere near as critical of MbS as the evidence should have warranted. The President instead emboldened his defense of Saudi Arabia by emphasizing America’s interests in the region, including references to inaccurate arms sales totals that were inflated. Rather than addressing the CIA assessment, Trump simply stated that “it could very well be that the Crown Prince had knowledge of this tragic event – maybe he did and maybe he didn’t!” Further stating that “we may never know all the facts,” the President diverted attention to the individuals the US has already sanctioned in the case and emphasized the importance of defending against Iran. President Trump’s attempts to divert the blame from MbS were followed by an expression of US gratitude towards Saudi Arabia for lowering gas prices not a day later. As the US administration continues to show support for a rights-abusing Kingdom, greater concerns are brought into question as to Saudi Arabia’s future abuses. The Kingdom is already infamous for its abysmal record of human rights abuses, targeting dissidents and human rights defenders, even frequently undertaking the execution of activists and members of the Shia community. Khashoggi himself was a prominent critic of MbS. With the White House refusing to take strong actions against the Crown Prince and Kingdom, it has allowed Saudi’s crackdown on dissent to continue without any international accountability. Such a weak stance on active human rights abuses only greenlights the evolution of more rampant impunity in Saudi Arabia. However, while the US administration has taken a backseat on the issue, the President has faced some backlash. At home, bipartisan efforts from the United States Senate Committee on Foreign Relations culminated in a letter sent to the President Tuesday evening demanding for an investigation into the Crown Prince’s involvement. Additionally, in response to the statement from the White House, officials in Turkey released scathing commentary that the stance was “comic,” accusing the President of looking blindly over the crisis. Even within the House of Saud, members of the royal family are recoiling from a Saudi future with MbS on the throne, going so far as to encourage a different successor to King Salman. Though it is still unclear if the CIA will release the Khashoggi assessment publicly, events leading up to this point should have resulted in a strong White House response to any potential hints of the Crown Prince’s involvement. Instead, the President has taken strides to mitigate blame and continue to bolster ties with the Crown Prince and the Kingdom. ADHRB condemns the White House’s stance towards Saudi Arabia and expresses grave concern over the future of accountability for rights abuses by the Saudi government. We call on the international community to take a stronger stance on Saudi Arabia and the Crown Prince, and further encourage the United States Congress to push the administration to investigate MbS’s role in Jamal Khashoggi’s murder. Without investigation or accountability, the US sends a grave message greenlighting impunity and abuse within the Kingdom.